This starter can go in so many directions. It’s perfect because it can be altered depending on your guests. Love cheese? Great! Make it cheese-centric. Have Vegan guests? 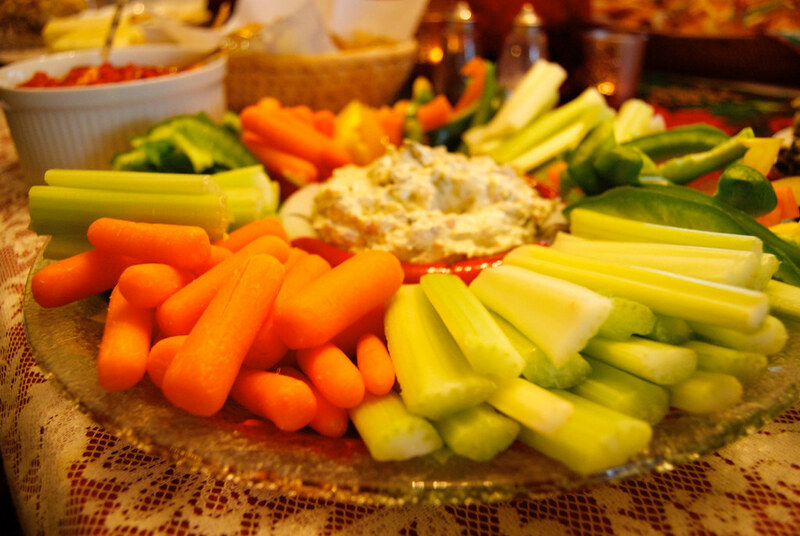 Make it a veggie tray! Pictured below is just one option, but fill your tray with whatever you please. Arrange your ingredients on a tray and lay it out for guests to enjoy while people arrive and mill about. Top Tips: Add some flowers or berries on the tray for decoration, and some fresh thyme and a drizzle of olive oil on the hummus to make it look straight out of a magazine. This recipe is great for a house party because it looks extremely impressive but really only uses one pan! It is delicious and filling while leaving your guests room for a little dessert. Preheat your oven to 130 degrees C.
Melt 2 tablespoons of the butter in a pan with the paprika then add the onion and sauté for five minutes. Cook for another minute with the chili. Stir in the chickpeas. Then add the rest of the ingredients besides the shanks (tomatoes, tomato puree and thyme) and cook for five minutes. Brown the lamb shank in a frying pan with the remainder of the butter. This should take about one minute on high heat. Put the shanks in the pot and put the pot in the oven for four hours. Top Tip: Serve with a dash of coriander over the top and with a couple sprigs of cilantro. You can also add some sautéed spinach. These treats offer the perfect time to relax and enjoy having your friends over, and finish off that house-warming bottle, after all, everyone knows that chocolate pairs well with alcohol, right? Peanut butter and chocolate pairs well with Cabernet Sauvignon and Rye Whisky. These are a great dessert option because they can be done ahead of time, without taking up the space that a small student kitchen will need for the rest of the meal. Melt the chocolate in a saucepan. Fill the muffin tins half-way with melted chocolate and put in the freezer for five minutes. Remove the muffin tin from the freezer and add the peanut butter (1 teaspoon if using mini-muffin tin, 1 tablespoon if regular sized muffin). Fill the tins the rest of the way and add your toppings. Freeze for another ten minutes or until you are ready to serve. Top Tip: use cupcake wrappers to make these a little more festive. This entry was posted in The Gastronome and tagged Dinner Party, Easy Recipes, Gastronome, impressive, three-course. Bookmark the permalink.